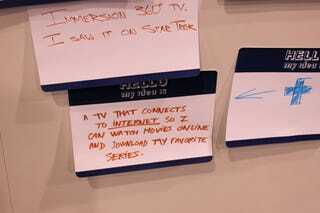 Last week you were crying out for more ideas from Haier's wall o' ideas, so I swung by there on the last day of the show to see if there were any more hare-brained suggestions. I was in luck! Of course, I'm willing to bet some of these ideas are taking the piss, but if at least one of them is actually serious, humanity is even more doomed than I once thought. Check out the first batch of ideas over here, if you missed them. Is this guy for realzies? Until Star Wars comes out on Blu-ray, I really don't see the point. The answer is: don't buy a 3DTV. Designers can have senses of humor, too. I'd say judging by the smell of some CES-goers, they didn't even bother with a catheter. Spamming goes back to the pen and paper days. Did anyone see a Dolby marketing guy lurking around Haier's stand last week? While phones don't often fold, I'm pretty sure you can watch TV on them and they fit in pockets. It's such a simple idea, why didn't Apple think of it before? Australians say the darndest things. Has this guy never seen an iPod Touch, Zune or Creative Zen in his life? I'll leave you with the CES equivalent of your mother's calendar. Enjoy.